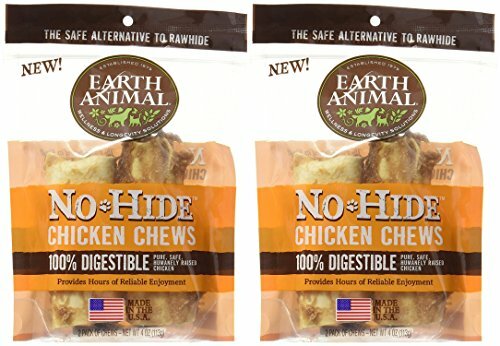 Earth Animal No-Hide Chicken Chews are easily digestible and 100% free of rawhide! These chews are made with humanely farm-raised chicken, meaning that there are absolutely no factory farms--Happy chickens make happy treats! Earth Animal's No-Hide Chicken Chews are a healthy way to satisfy chewing urges all while maintaining your dog's dental health by scraping away plaque and controlling tartar buildup as they chew. The one of a kind chew is rolled out and baked with fresh organic eggs and olive oil for a delicious, long lasting treat that your dog will love!